Learn more about teacher portfolios here. Teachers can create a portfolio story from scratch, or duplicate a relevant child story to edit and save to their portfolio. You can create a portfolio story in the same way you create a child story. If you don't know how to create a child story you can follow these instructions. But in the drop-down selector, instead of selecting children to add to the story, you select 'My portfolio' and then yourself. Follow these instructions to learn how to duplicate a story. Once you've duplicated a story, it will be saved to your drafts and you are free to edit any aspect of it before publishing it like any other story. 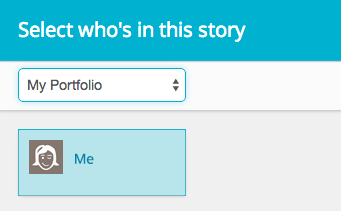 When you publish a portfolio story it will be saved to your personal portfolio and activity stream, and can only be seen by yourself and other invited teachers. You can link your published portfolio stories together in a plan, eg. one created from the Storypark Appraisal Goals template. Learn more about linking portfolio stories to plans, here.